When Princeton anthropologist John Borneman arrived in Syrias second-largest city in 2004 as a visiting Fulbright professor, he took up residence in what many consider a "rogue state" on the frontline of a "clash of civilizations" between the Orient and the West. Hoping to understand intimate interactions of religious, political, and familial authority in this secular republic, Borneman spent much time among different men, observing and becoming part of their everyday lives. Syrian Episodes is the striking result. 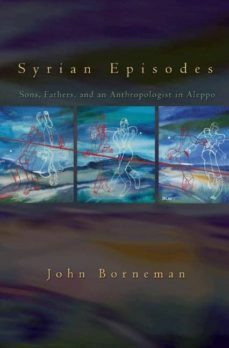 Recounting his experience of living and lecturing in Aleppo, Syrias second-largest city, John Borneman offers deft, first-person stories of the longings and discontents expressed by Syrian sons and fathers, as well as a prescient analysis of the precarious power held by the regime, its relation to domestic authority, and the conditions of its demise. Combining literary imagination and anthropological insight, the books discrete narratives converge in an unforgettable portrait of contemporary culture in Aleppo. We read of romantic seductions, rumors of spying, the play of light in rooms, the bargaining of tourists in bazaars, and an attack of wild dogs. With unflinching honesty and frequent humor, Borneman describes his encounters with students and teachers, customers and merchants, and women and families, many of whom are as intrigued with the anthropologist as he is with them. Refusing to patronize those he meets or to minimize his differences with them, Borneman provokes his interlocutors, teasing out unexpected confidences, comic responses, and mutual misunderstandings. He engages the curiosity and desire of encounter and the possibility of ethical conduct that is willing to expose cultural differences.Combining literary imagination and anthropological insight, Syrian Episodes offers an unforgettable portrait of contemporary culture in Aleppo.